Starting from mid-December, travel time between Seoul and the port city of Gangneung in Gangwon Province will be shortened to 1 hour and 40 minutes from the previous six hours via regular trains and three hours via express buses. 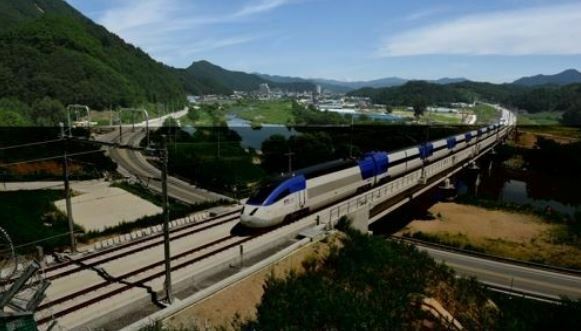 In June, Korea Rail Network Authority completed construction of the 277.9-kilometer railroad linking Incheon Airport and Gangneung. Trial trips began on Oct. 31. The new route allows for a maximum travel speed of 250 kilometers per hour and takes passengers straight from the airport to the coastal city. A budget of 3.7 trillion won ($3.32 billion) went into the building of 34 tunnels and 53 bridges to provide transportation from Incheon Airport and Seoul to stadiums that will be used for the PyeongChang Winter Olympics. The six new stations along the route are Manjong, Hoengseong, Dunnae, PyeongChang, Jinbu and Gangneung. The last three stops -- PyeongChang, Jinbu, and Gangneung -- are designed to facilitate easy access to stadiums. During the PyeongChang Olympics in February, the train will run 16 times a day from Incheon Airport, 10 times from Seoul Station, 10 times from Cheongnyangni and 15 times from Sangbong Station. Fare prices will be between 25,000 to 30,000 won, depending on the departure location. Once the Olympics Games are over, the trains will run less frequently, but enough to accommodate travelers who are interested in checking out Gyeongpodae and Jeongdongjin beaches.